The news that a lesbian had been elected mayor of Houston, deep in the heart of the conservative South, was greeted with surprise this week. After defeats on gay marriage in places deemed far more gay-friendly than Texas, like Maine and New York, the victory of Annise Parker, who is in a committed relationship with two children, was a welcome, if puzzling, achievement for advocates of gay rights. The mayor-elect's photograph, showing her smiling sweetly and looking like Barbara Bush, was plastered everywhere from the Drudge Report to China's Xinhua news service, shattering all manner of clichés about Texas, lesbians and politics in the Old South. Gay-rights activists were buoyed. "The fact that an openly gay candidate wins for mayor in the nation's fourth largest city, in the South, in Texas, shows that when Americans get to know gay people as people, not as stereotypes, their resistance to treating gay people equally reduces," Evan Wolfson, director of Freedom to Marry, a gay-marriage advocacy group, told USA Today. In terms of geography, Houston may be a city in the Old South, but its personality is a mix of Western frontier and Third World boomtown: dynamic, diverse, a place to make a fortune and lose one. Only 40% of greater Houston area residents live inside the Loop, the freeway that defines Houston's city limits, and only 1 million of the city's 2.2 million residents are registered voters. Many are immigrants who cannot vote. The key to winning any Houston mayoral race is coalition-building, and Parker's political career has been deliberate, "low risk" and "canny," according to Richard Murray, a veteran political analyst and political science professor at the University of Houston. Her political journey echoes, to some degree, that of Houston's only other female mayor, Kathy Whitmire. Like Whitmire, Parker used the job of city controller as a jumping-off point, built on her base in the Montrose neighborhood (heart of the city's large gay community) and reached out to vital constituencies, like African Americans, Hispanics, Asian Americans and moderate, affluent Republicans. Indeed, Parker's victory may come down to that old adage: all politics is local. The 53-year-old former bookshop owner and energy-sector professional was well known to Houston voters. This was her seventh successful citywide election (she had won three times for an at-large city council seat and three times to serve as the city's controller). Parker did not make her personal life an issue, running on a platform of fiscal conservatism, budget discipline and a promise to hire a new police chief who would translate some of the large police-budget increases into actual cops on patrol. Parker's opponent in the runoff was a fellow Democrat, Gene Locke, who was also familiar to voters. A lawyer and lobbyist for the city of Houston, he won the backing of Houston's business leadership. An African American, Locke could have pulled key support from the black community but ran a "pretty bad campaign," according to Murray. The late revelation that two members of his finance committee had supported Hotze's anti-gay PAC did not help Locke with moderate Republican voters, who saw the issue as not central to the vote. The business establishment, which originally felt that Parker could not win, cooled to their chosen candidate as the runoff campaign evolved, Murray says, and Parker was able to win the race 53% to 47%. Turnout was also low  just 16.5%  meaning the candidate who was better organized to get out the vote would win. As for Parker's being gay, Murray explains that Houston's voters "are not that caught up in 'lifestyle' politics ... Across the whole country, attitudes have been evolving about issues like civil unions, and Texas is still part of the United States of America." It should also be noted, says Murray, that while Governor Perry's anti-Washington jibes may resonate in Houston's conservative suburbs, they have less impact inside Houston's city limits, where 62% of voters cast ballots for Barack Obama in 2008. Todd Hill, a gay Democratic activist in the DallasFort Worth area, says Parker's win does have a wider meaning. "I don't believe that Parker's victory gives life to wider LGBT agenda initiatives. But I do believe that her election gives momentum toward qualified, experienced and politically savvy gay candidates running for public office," he wrote on the political blog Burnt Orange. Gay candidates have won a seat on the Fort Worth city council and as sheriff in Dallas. Gay candidates must work at the local level, Hill says, building a record and political bench. "If you want to really make a mark and move elements of the LGBT agenda forward, get members of our community elected into positions of political power," Hill urged. 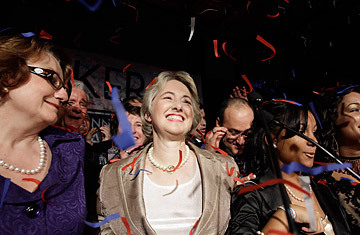 It is the grass-roots route that Parker adopted more than 18 years ago, and while she acknowledged that her victory was a significant moment for the gay community, she also told the Houston Chronicle, "One of the reasons I'm not having that big, excited, happy feeling is that there is a lot of work to be done ... I"m going to be the mom telling you to eat your vegetables [or] you don't get dessert." After all, local politics is not about savoring the glory; it's about delivering the goods. See TIME's Person of the Year 2009: Ben Bernanke.